The Buck 179 Mayo Hilo, designed by Tom Mayo, took inspiration from the surf and the sharks of the Hawaiian coast. The Hilo is all about sleek lines, light weight, and shark-tooth efficiency. The bead blasted finish may have been intended to simulate sharkskin, but you'd probably not make that connection unless you knew the background. If you need a good pocket clip folder for use around saltwater, whether you're a fisherman or sailor or surfer, the Mayo Hilo could be your best bet. 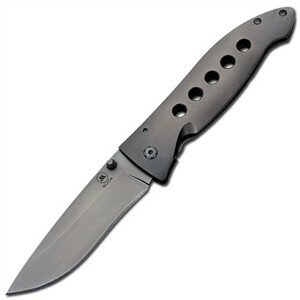 A 3-5/8-inch drop point 420HC stainless steel blade slips from the stainless steel handle with a gentle push on the thumb stud and locks into place with Mayo's patented frame lock, an integral spring section of the grip. Push from the other side to release the blade. It's a good idea, since tightening your grip on the knife only sets the lock more firmly in place. Titanium coatings on both blade and handle will reduce the corrosive effect of saltwater, still a problem even with today's modern corrosion-resistant alloys. The knife folds to 4-1/2 inches and needs no sheath -- use the stainless steel pocket clip to secure it on your hip in easy reach. Unlike some modern knives engineered for the lightest weight possible, the Buck Mayo Hilo doesn't sacrifice strength by skeletonizing the metal of the handle. A series of holes reduces the weight to four ounces but doesn't remove enough steel to weaken the build. Keep a good grip on this folder, because although the shape of the knife fits the hand well enough, the finish itself is a little smooth.